What the Heck is That Tower for? Feb. 21, 2013 4:00 p.m.
One kilometer south of Leduc on Highway 2A on the west side of the road stand two towers. They are approximately 8 meters tall and equipped with what appears to be lights, cameras, antennas and other gadgets. The mystery is that the towers look pretty sophisticated but to the average driver and passenger, don’t seem to have any logical or identifiable purpose for being there. First guess. A highway live cam like those used by AMA (now 511) to provide live views of highway conditions and weather for travellers. 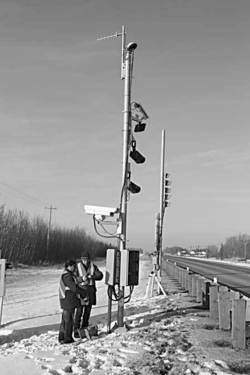 However, upon checking the AMA website the only live cam in the region is located on Highway 2: South of the Highway 2A Overpass near Leduc, not on Highway 2A. Commercial vehicles, the towers are watching you! Now that I have the answer to the mystery, I am comfortable the ‘Twin towers of Leduc’ are there to make our highways a safer place to be. However, every time I drive past the ‘Twin towers of Leduc’ and see the automated screening device I now know is loaded with cameras and blinking down at my Ford F 150, do I dare exceed the speed limit?.